Amazing attractions, unforgettable animal interactions and incredible shows, including the Shamu Adventure. World-class marine life exhibits in San Diego. Exclusive Family Pack Offer SeaWorld San Diego 7 days for the price of 1! Unlimited admission to SeaWorld San Diego for 7 consecutive days from date of first use. SeaWorld San Diego 7 days for the price of 1! Child: (ages 3-9) Extra Savings! 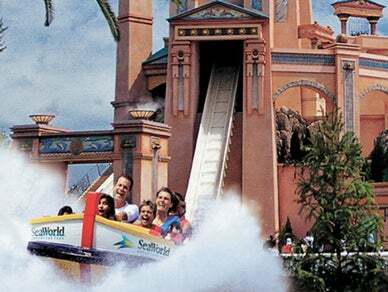 Enjoy single-day admission to SeaWorld, PLUS enjoy all-day dining. *All Day Dining is valid at participating restaurants: Shipwreck Reef Cafe®, Calypso Bay Smokehouse, Mama Stella's® Pizza Kitchen, and Pineapple Pete's Island Eats. All-Day Dining entitles the purchaser to up to three (3) total items each time through the line as often as once every hour until restaurant closing. The Go San Diego® Card is the best choice for maximum savings and flexibility. Save up to 55% off retail prices on admission to over 40 top attractions and activities for one low price, including the San Diego Zoo, LEGOLAND® California, Safari Park, and more. Enjoy the flexibility to choose attractions as you go and do as much as you want each day. Your Pass(es) will be delivered separately within 24-48 hours to the e-mail address provided at check-out along with a digital guidebook. Print your Pass or present it right on your mobile device to get into each attraction. @DarylOdom Glad to hear you had a great time!